Vince’s Cross and “Our Lady of the Snows” Shrine. 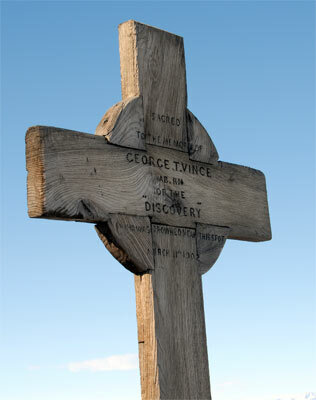 Immediately above Scott’s Hut on a small knoll overlooking the bay is Vince’s Cross, a wooden cross erected in 1902 to commemorate Seaman George T. Vince, the first man to lose his life in McMurdo Sound, following a fall into the water from a steep, icy slope nearby during a blizzard. the sea ice. 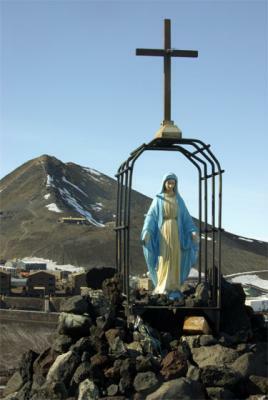 Near this shrine is a monument erected to commemorate Raymond T. Smith, a Navy petty officer killed during a ship unloading accident at McMurdo in February, 1982.